How far should you go to keep a secret? No-one ever accused Sophie Campbell of being a coward. From caving trips to rooftop pranks, it appeared nothing could hold her back, especially once she landed a dream job promising travel all over the world. 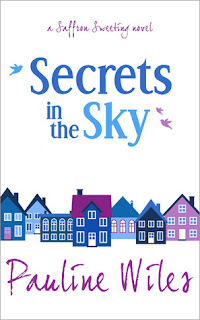 Secrets in the Sky was a surprise read for me. I wasn’t initially sure what to expect because I didn’t immediately understand the thought process behind the actions of some of the characters. They seemed to be behaving oddly- which makes sense now as many of them are harbouring some secrets from each other. However, I was immediately on Sophie’s side for no other good reason than that I liked her from the get-go. Something about her earnestness made me want her to succeed but she seemed to be having a hard time determining what she wanted her success to be and her insistence about keeping her job a secret from her mother made me a bit crazy. Pauline Wiles inserted some vastly irritating (but amusing) personalities into the plot of this novel. Namely a rather vocal bird, a rather frustratingly simple ex-boyfriend/current boyfriend and a number of interfering villagers but there were also some steadfast friends. Her roommate was sweet and I liked both the real-estate agent who was on Sophie’s side and the American woman who ran the support groups. My only hesitancy with my overall feelings was that I felt more warmth could have been made between the sisters. I think there was something missing in their interactions or perhaps it was just their age gap that created this, or their unusual upbringing? But I wished for more closeness there. The novel was charming and the romantic plot twists were sweet. I wouldn’t hesitate to read another novel about Saffron Sweeting!